PublicSectorJobs.info Reviews - Legit or Scam? PublicSectorJobs.info Reviews – Legit or Scam? Public Sector Jobs, found at PublicSectorJobs.info, is a new job search website that helps people specifically looking for new employment within the public – or government – sector. According to PublicSectorJobs.info, the public sector is the largest and most stable employment environment in the US, with 20,000,000 currently active positions with an expected increase in available positions by 10% or more over the next decade. PublicSectorJobs.info is free to use. All they ask is that you accurately fill out your name and email address, for contact purposes, and then fill out a short questionnaire for them before you are able to access their jobs database. Also, they do share your information with affiliates and outside third parties to use for advertising purposes. So be aware that when you fill out the questionnaire on further your education, declaring bankruptcy, or finding cheaper health insurance, that your email inbox will soon be filled with advertisements from companies related to these topics. 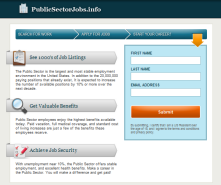 After you have finished filling out the questionnaire at PublicSectorJobs.info, you will be taken to LocalJobsForAll.com, another job search site that will require you to complete yet another questionnaire before you can access their jobs database. This second questionnaire is the same as the first, in that your information will be given or sold to third party sources to contact you, including your phone number. If you input your phone number, you will be contacted by sales people via the phone, whether or not you have registered with the National Do Not Call Registry. Neither of these sites should be considered a good jobs search resource. If you are actually interested in government job, check USAJobs.gov, the government’s free, easy to use jobs search website. Average Rating for " PublicSectorJobs.info " is 1 out of 5 based on 2 reviews. Soooooo annoying, I can not search any page and your pop up won't go away, you make my day hard and difficult, if I see you face to face I love to punch and knock you IDIOTS. They are using a popup that is not blocked on my computer that does not allow you to get off it. This stuff is so annoying. No professional business would need to resort to this. Christine Gulledge on EZ Money Method Reviews – Legit or Scam? Sam on Survey Rewardz Reviews – Legit or Scam? Ray on Oxford Club Reviews – Legit or Scam? Tiffany on Product Report Card Reviews – Legit or Scam?